If you haven't yet gotten your flu shot this winter, consider this: a study published in the October 23/30, 2013, issue of The Journal of the American Medical Association found that getting an influenza vaccination was associated with a lower risk for developing major heart problems. How much lower? About a third, and that effect lasted for up to a year, warding off conditions such as heart failure, heart attack, stroke, and even death. The biggest protective benefit was for people who had recently experienced heart problems such as a heart attack or unstable angina—a 55% reduction in major cardiac events compared with other patients. 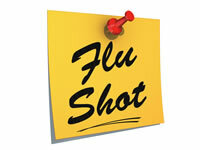 Researchers believe a flu shot may stop the virus from causing trouble in your arteries. "The virus might actually stir up inflammation and affect the cholesterol plaques in the artery, which then break open and lead to a heart attack," says study author and cardiologist Dr. Christopher Cannon, a Harvard Medical School professor. The study didn't absolutely prove that flu shots protect against heart attacks, and the research team hopes to do a larger prospective trial. Ask the doctor: Any health benefits in dessert drinks? Are we prepared for epidemics?